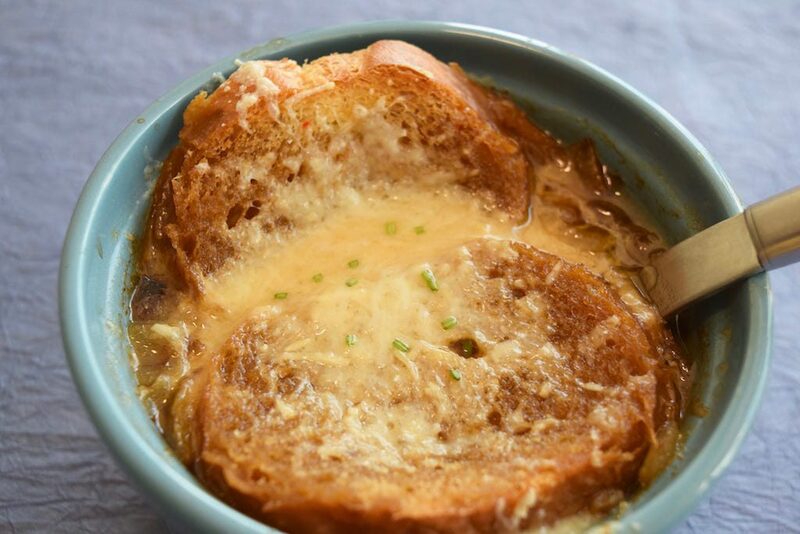 French onion soup has always been a favorite appetizer of mine, though I don’t seem to find the time to make it very often. Of course, recipes vary for this very old type of soup, but this one is pretty easy. A quick bit of research reveals that the basis of today’s recipes go all the way back to ancient Greek and Roman times. Today’s form of the soup evolved from the 1650s, according to The Food Timeline. That’s quite a history. The simple recipe presented here is from Bon Appetite, October 2011. It’s flavorful and doesn’t require exotic ingredients. *Make sure to use a true baguette. I used toasted hard-roll slices, which quickly got soggy and did not allow the cheese to brown properly. It did, in fact, ruin the soup. Caramelize the chopped onions in a large skillet in any way you see fit. Low and slow works best, in my opinion. When onions are done, add butter to the pan and mix to ensure the onions get coated. Remove from heat and add the brandy, returning the pan to the heat until the brandy is absorbed. Add the beef stock and bring to a simmer for about 5 minutes or so, until the liquid is somewhat reduced. Add salt and pepper, to taste. 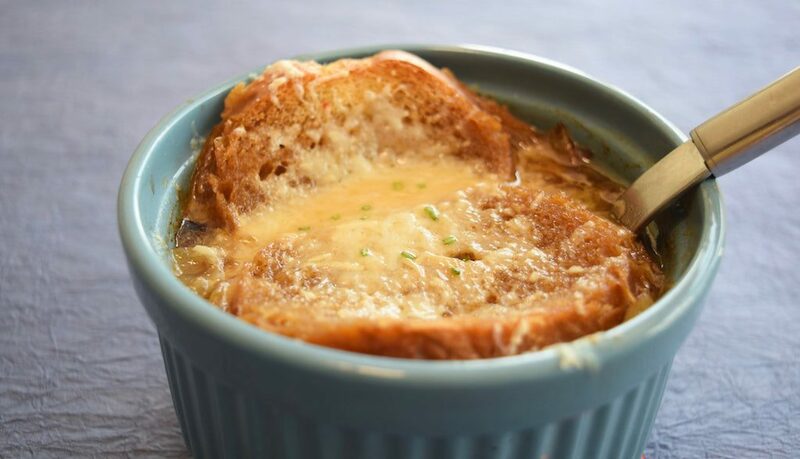 Divide the soup into ramekins and top with the baguette slices and cheese. Put the ramekins on a baking sheet and bake until the cheese is browned and bubbly, which takes about 4 or so minutes.